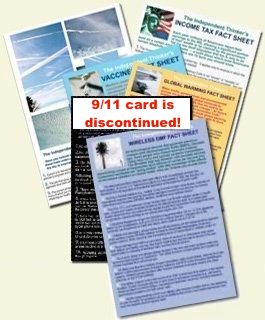 These are the very popular Independent Thinker's Chemtrails Fact Sheets — color cards with 10 facts about geoengineering and aerosol spraying. Perfect to hand out to people new to the subject, or to refer to if your own knowledge needs a little help. (It's not easy to explain that we really do have man-made clouds these days, and NASA admits it!) Cards measure 5-1/4 x 7-1/2 inches. Click here to enlarge. PLEASE NOTE: Because international shipping has gone up so much, we can no longer ship cards outside the U.S, except to Canada. 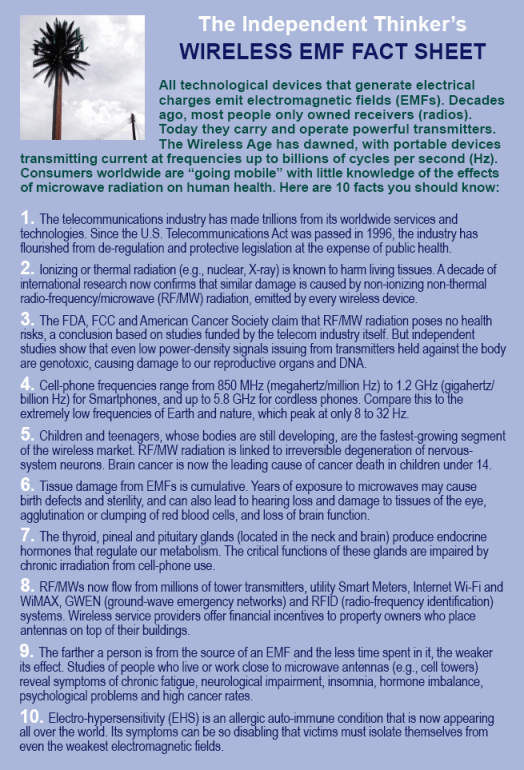 Today just about everyone carries a cell phone, and wireless technology now blasts EMFs all over this country and all over the world. 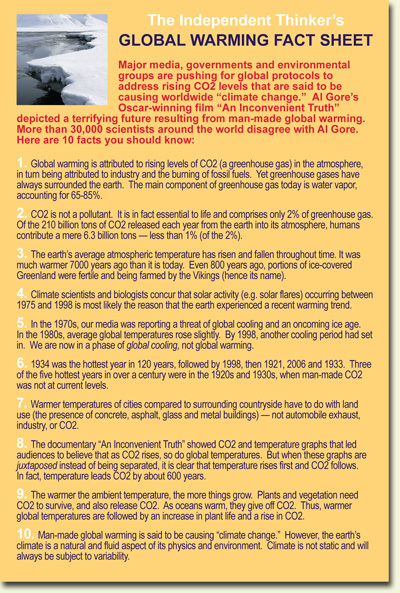 This 10-point fact sheet is part of our popular Independent Thinker's series and lists dozens of resources (books, scientific reports, documentaries and websites) on the back side, with room to write in your own information. PLEASE NOTE: We can no longer ship cards outside the U.S, except to Canada. Second printing of The Independent Thinker's Vaccines Fact Sheet is now available. 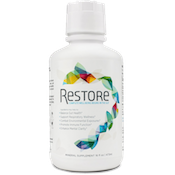 Includes an important mention of food allergies! Ten facts on the front and dozens of resources on the back, including an updated list of some of the best and latest books. Very important to distribute to parents...and all those seniors marching in for flu shots! Click here to enlarge. 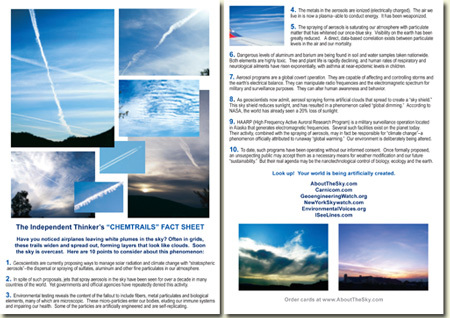 The Independent Thinker's Global Warming Fact Sheet is useful to hand out with the Chemtrails Fact Sheet, as geoengineering (a.k.a. chemtrails) will be said to be necessary to "correct" the effects of supposed man-made global warming. Ten facts on the front, dozens of books and other resources listed on the back. The reality of income tax is vastly misunderstood, even by those who think "it's unconstitutional". 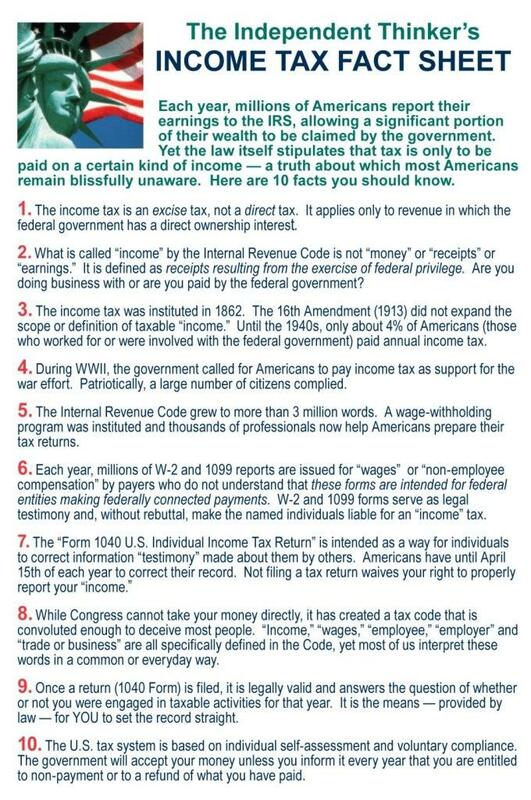 This Independent Thinker's Fact Sheet is a messaging tool like no other on the subject of taxation! Click here to enlarge. Just about everybody will appreciate this one! It measures 11 x 3.5 inches, it's vinyl and weatherproof.